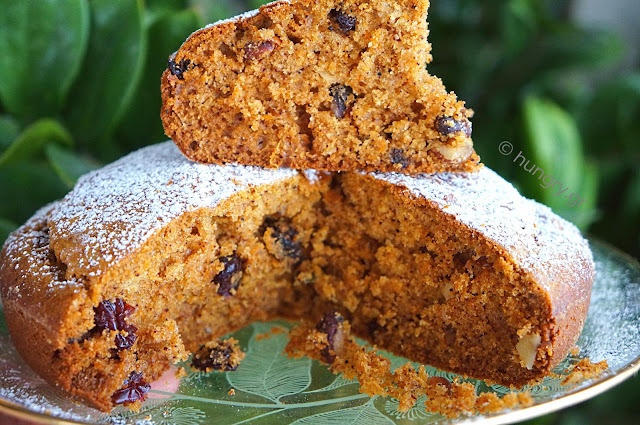 Based on pumpkin puree and aromatic spices create a very aromatic, very fluffy and healthy cake with stevia. 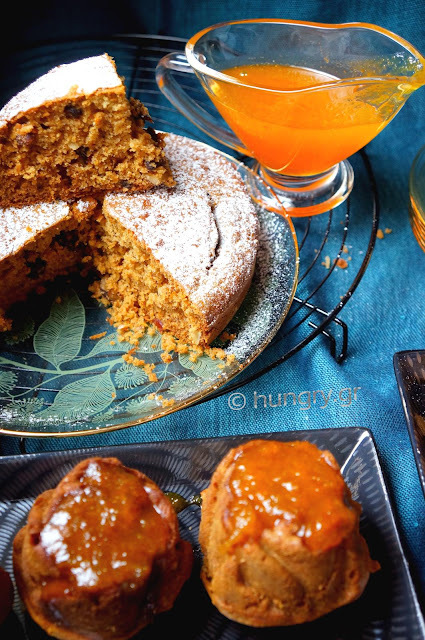 Adding pumpkin puree keeps the cake juicy and compact, fluffy and stable without falling down crumb. The crumbs that we see in some photos is because it was hot even when cut, not left to cool well to be stabilized. First prepare the yellow pumpkin puree to have time to cool down. Clean and remove the fibers, seeds and peel from the slice of pumpkin. It will stay clean weight 300g (10.6 oz) pith. Chop the pith into bite-size pieces and place in a saucepan with the orange zest and 4 tablespoons orange juice. Boil until you have a soft pumpkin, evaporate the water and get easy to pierce with a fork. 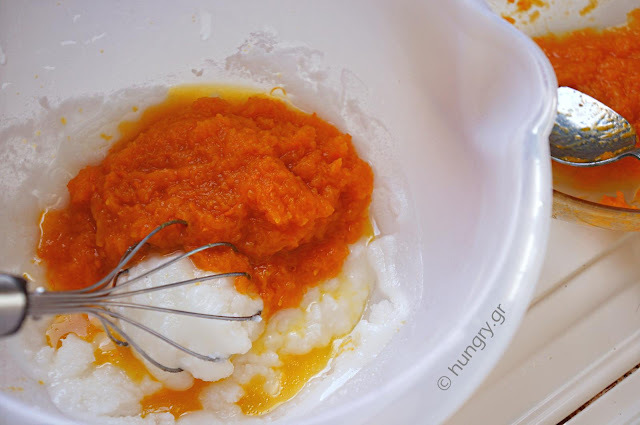 Push the pumpkin with a fork to make puree. Let it aside to cool. 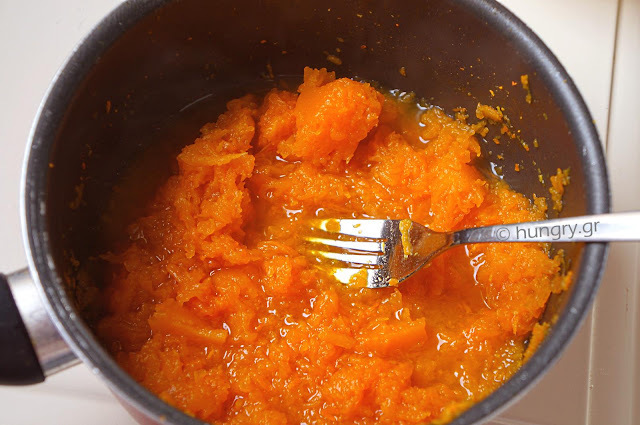 In a large bowl, add the oil, the stevia (or sugar) and pumpkin puree, after keeping aside 2 tablespoons pumpkin puree for the glaze. Stir with whisk. Add the yogurt, eggs and spices. Stir gently to combine ingredients. Do not beat too much. 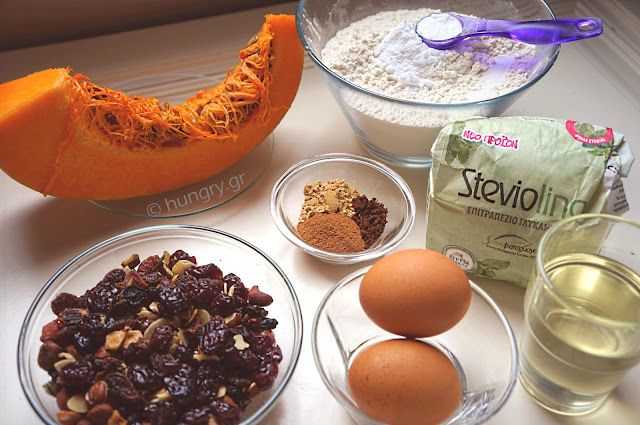 Sift the flour with the baking soda and pour gradually into the bowl with the mixture. Stir to combine the ingredients. 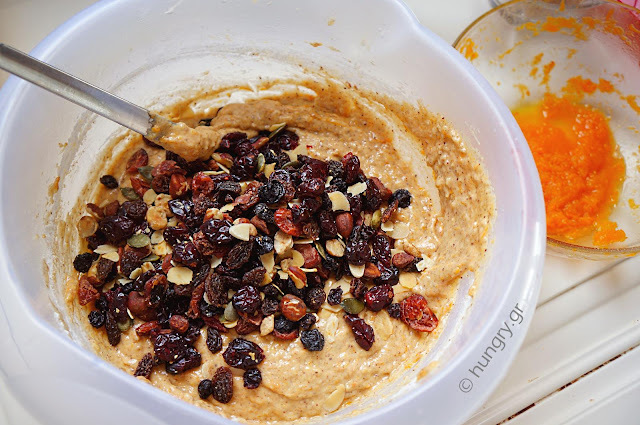 Add nuts and dried fruit. Stir. The mixture is quite viscous. 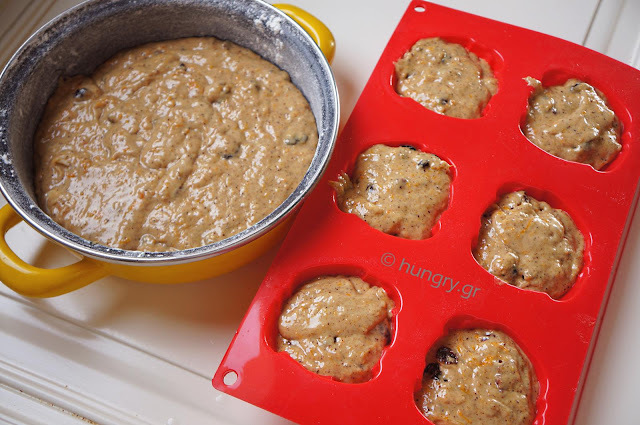 Pour into an oblong or round form, buttered and floured or hand ot in ramekins for individual cake. Bake in a preheated oven at 170℃ (338℉, Gas:3.5) for 30'-35'. 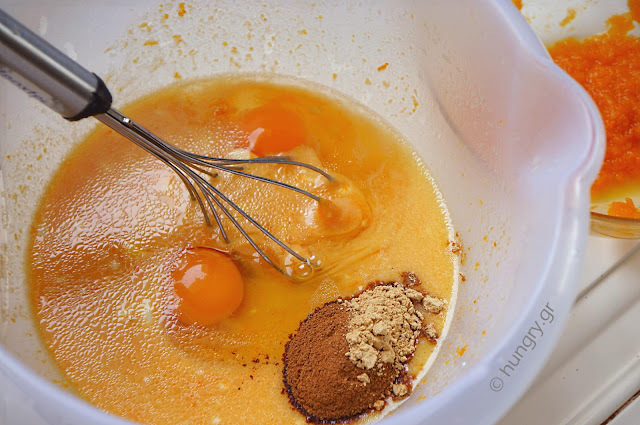 If you want we make a glaze with the purée you kept, 5 tbsp powdered sugar and 2-3 tbsp of orange juice. Boil together until you get the density you like and with it glasse the cake or cupcakes or just eat them plain or with a little icing, sprinkled on top. Dehydrated / dried fruit give it flavor. Some of these are slightly candied. 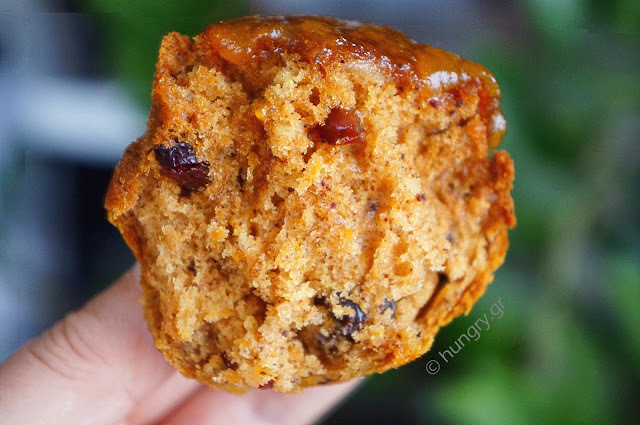 Drizzled with warm honey and sprinkled with almond flakes surface helps flavor intensity. Let me not forget to praise you on how fluffy it was, but… it looks like it, I think, so you save yourself the verbiage! 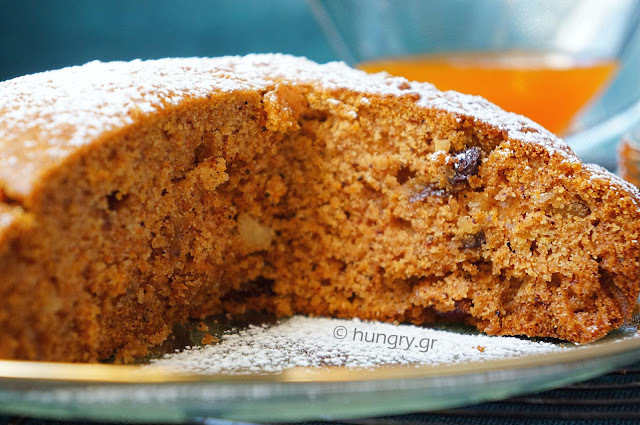 Carrot cake without flour, and by extension Gluten Free for those who follow a gluten-free diet, have an intolerance to it, or do not wish to consume cereal. 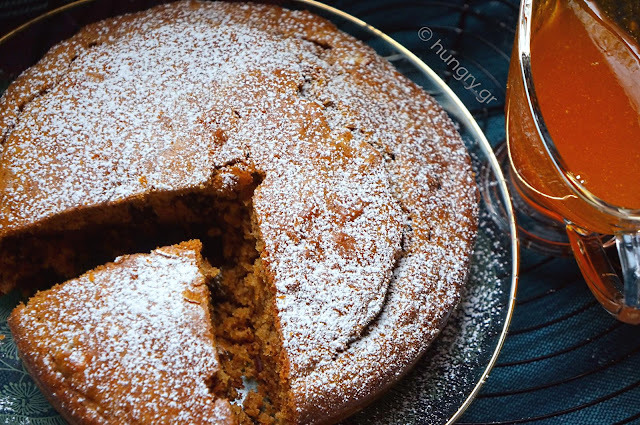 Beyond this, the cake is very rich in ingredients and very tasty. The coconut flour substitute perfectly normal flour and is very tasty. The addition of cream cheese comes to further intensify the flavor. 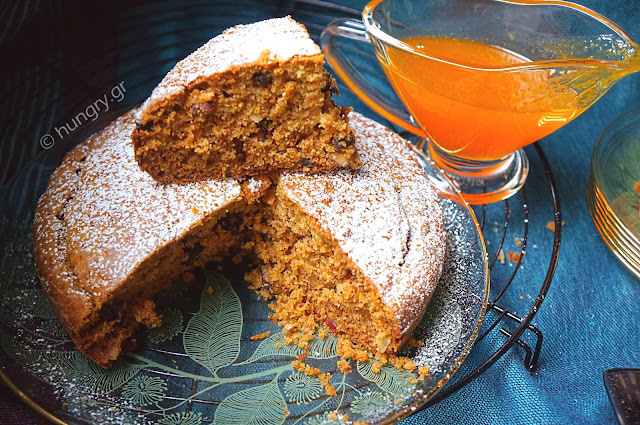 Cake very tasty, festive, crunchy with poppy seeds and many dried fruits, soaked with the juice and zest of fresh orange. 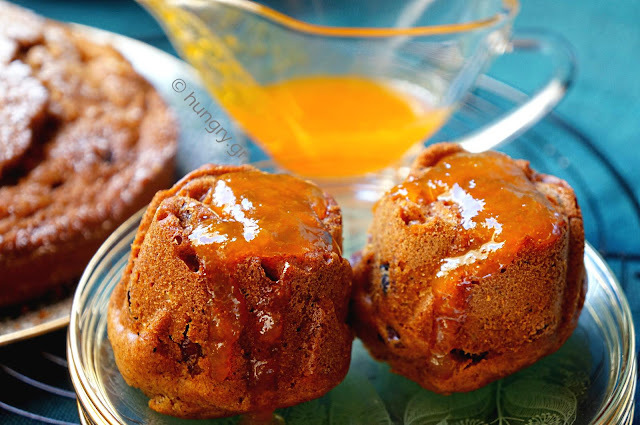 The oil gives a special texture, moisture and flavor and its unique taste and sweetness of dried fruit make it irresistible. Certainly is one of the cakes that we make again and again.